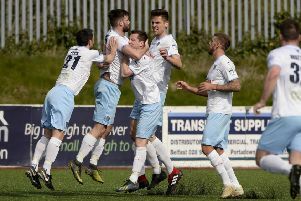 Ballymena United brought the curtain down on their popular pre-match corporate lunches for this season on Saturday. A total of 31 tables attended the event - which was sponsored by Michelin Athletic Club - prior to Saturday’s home game against Dungannon Swifts. Top table guests at Saturday's Ballymena United pre-match corporate lunch in the Des Allen Suite pictured with club chairman John Taggart. Among the guests were former United players Nigel Boyd and Dessie Loughery. The club has thanked all the individuals and organisations who took tables at the three functions throughout the season. * The First Score prize of £250 was won by Jack Harper, who predicted the exact time of the opening goal.